Personalized monogrammed tumblers with a lid and straw with three items to include photos and captions. The wrap around the cup is made of very durable weatherproof polyester and is meant for heavy duty use. The wrap ends of each side will overlay in the back. This area does not end with a complete photo or caption. - personalized with ONE or TWO photos of your choice and ONE Caption. If you prefer THREE photos that can be done but without the caption. Please email the photo or photos after you submit your order. if I don't here from you, I will contact you for the photos directly. Captions are listed on the other images above. 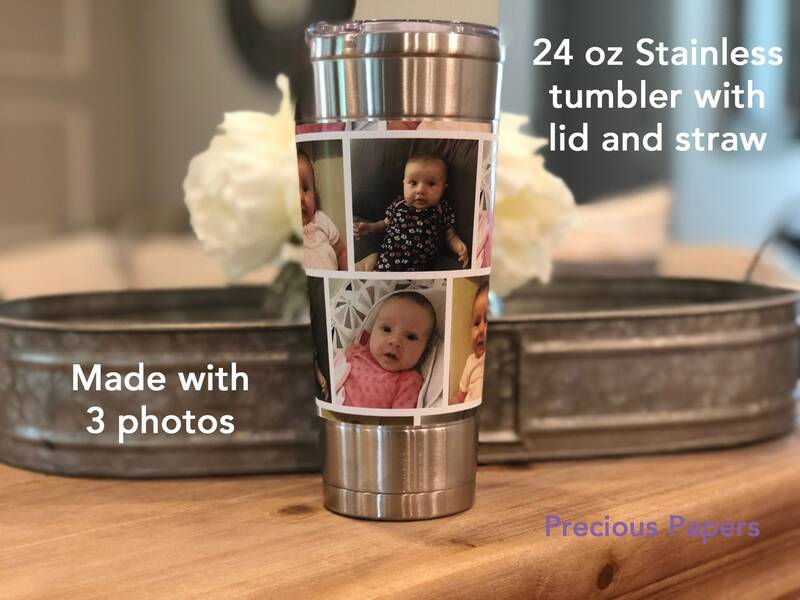 We will make your tumbler and ship it upon approval within one business day. All items are shipped US Mail. Due to the personalization of the product we will not accept refunds for this item. The wrap around the cup is made of very durable weatherproof polyester and is meant for heavy duty use. The shop owner helped me in fixing up my design to fit the cup I wanted, which I really appreciated! 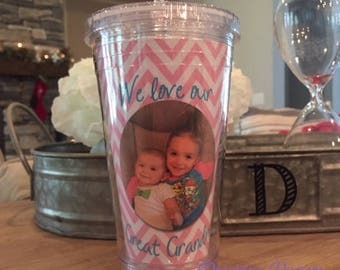 I got my sister the tumbler cup with the straw and she loves it! The straw did break after a drop, but that's to be expected, and the cup was very durable!! Gorgeous product! Great quality! And was shipped very quickly! Will absolutely order from this shop again!